Sometimes a story is so huge that it takes over everything, there is no escaping it and few want to. Think 9/11, Diana's car crash. Sometimes a story is so big that it dominates news bulletins and front pages for days or weeks, but you can avoid it if you really want to. Think the Iraq war, MPs' expenses. Sometimes a story is so important that it is still the splash on 'day three', even when nothing much has happened. 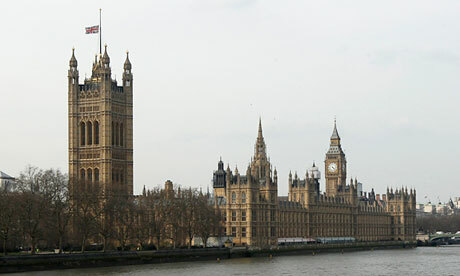 Think American presidential elections, the death of Margaret Thatcher. Thatcher's death? It's that important? Well every paper but the FT and the Express is splashing on the Iron Lady today, so it must be. Or maybe there has been a collective misjudgment. 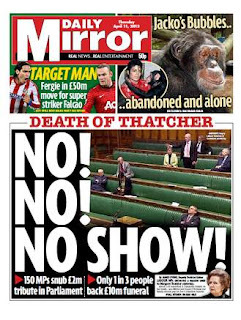 In fact there seems to have been a collection of collective misjudgments since Thatcher died on Monday - most notably the lavishness of the funeral and the decision to recall Parliament yesterday at a cost of nearly £4,000 per MP attending. Clearly there is a paucity of news, after all it is the Easter holidays. Who cares about North Korea or the G8 or Obama's budget? Or that the Treasury has only just produced the 2010-11 accounts for 1,500 public sector organisations with £2 trillion of liabilities? Or that not only are the numbers late, but they are also inaccurate and incomplete (they don't include Network Rail, RBS and Lloyds Banking Group, which might just make a difference), so they haven't been approved by the Auditor General? Or even the weather, which is expected to take a turn for the better at the weekend? No, nothing competes with the public's avid interest in a procession of white men in dark suits taking turns to spout platitudes about the death of an 87-year-old woman who left office 22 years ago. Or the sight of Ed Miliband teetering across a rickety bridge to meet Cameron briefly in the middle without betraying the friends holding the ropes - and their noses - back on the bank. Was this an intentional twist on Mark Antony's 'Friends, Romans and countrymen' speech? If so, perhaps the headline writer misunderstood Shakespeare - or hadn't got beyond the second sentence. 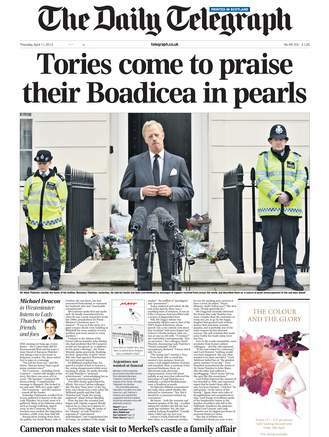 Still, Boadicea in pearls was a nice idea (Boudicca would have been better, but of course you can't trust the reader to know who she was). And the photograph? 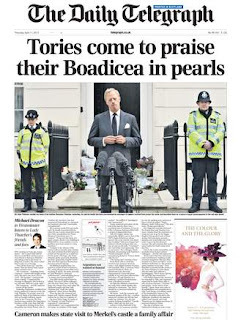 A praising Tory? Boudicca? No, none other than Sir Mark Thatcher with his best Blair-sincere face at the microphone outside his mother's house, flanked by a couple of policemen in hi-viz jackets. There are a few bunches of flowers on the doorstep in the background and it is a nicely balanced picture: the policewoman in a cap on the left, head down, arms behind her back; the policeman in a helmet on the right, head up, arms to the front in free-kick-wall mode. 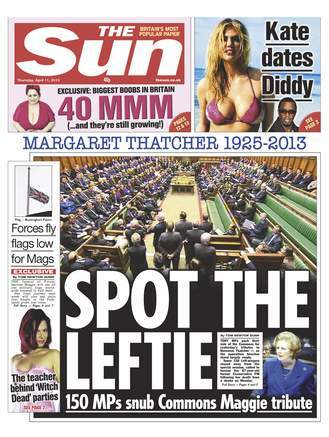 But as a friend tweeted 'Even diehard Maggie-worshippers don't want to see a picture of HIM'. The words set ragged right underneath are a sort of sketch but not quite, because only the people in the story are allowed to make jokes. It is not, by any stretch of the imagination, a splash. The Guardian did manage to get a couple of news points into its lead - that the Speaker had not wanted to recall MPs and that there was a bit of a kerfuffle over the instruction that MPs should wear mourning dress - and sensibly put these in the headings. 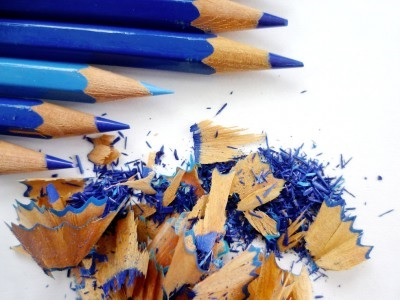 But the guts of the piece were still a series of quotes, angled on Miliband's tricky task. The page was rescued by the striking illustration and by Simon Hoggart's sketch on the right. 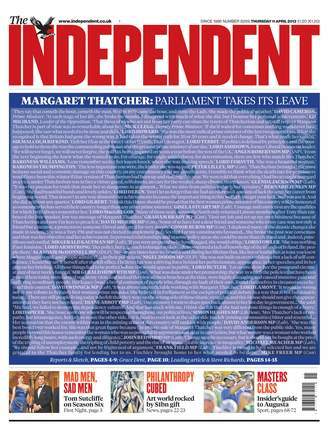 Even more striking was the Independent's approach. It ditched the front-page story altogether in favour of a bluetone photograph of a relatively youthful Thatcher overlaid with quotes from Parliament. There's nothing more to say about it other than it's a great idea beautifully executed. The Mirror and the Sun both pounced on the Labour semi-boycott of the tribute recall with picture-led pages that demonstrated how one idea can be used to promote diametrically opposed ideologies. Meanwhile the Mail pushed its agenda with a story about two teachers involved in organising celebrations of Thatcher's death. 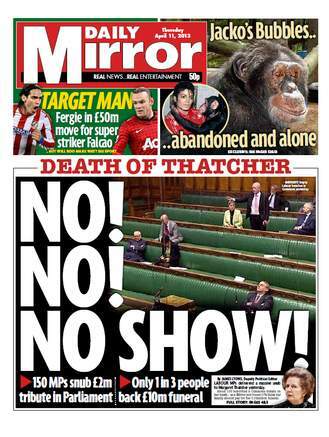 This was a shoo-in for the splash, since it not only involved leftie teachers, but one of them works at the school attended by the Miliband brothers. Clearly a hotbed of radicalism. Intriguing, though, to imagine how the boy Milibands might have been led on the path to the wicked Left by this monstrous man, given that he is 20 years younger than David and 15 years younger than Ed. 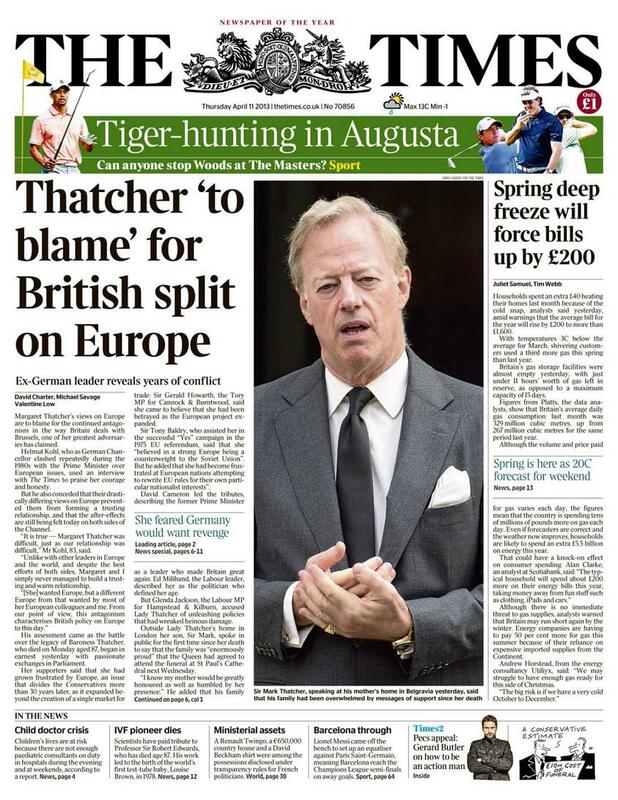 The Times also turned its back on Westminster, but not on Thatcher, and managed to make a splash out of not one, but two octogenarians. 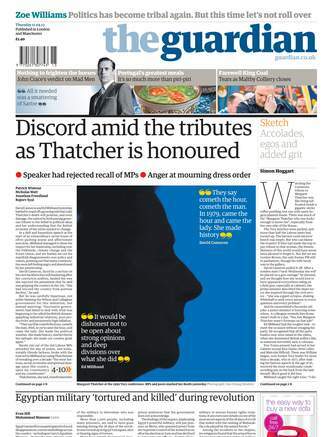 And, like the Telegraph, it made its front page even more appealing to the passing reader with a Mark Thatcher photograph. The paper was evidently pleased to have been granted an interview with Helmut Kohl, who served for 16 years as German Chancellor and had plenty of run-ins with Thatcher about the EU (as it was then) in the 1980s. Kohl blames Thatcher for Britain's ongoing divisions with and about the EC. "It is true - Margaret Thatcher was difficult, just as our relationship was difficult. Unlike other leaders in Europe and the world and despite the best efforts of both sides, Margaret and I simply never managed to build a trusting and warm relationship." This is such an astonishing revelation that the paper not only runs a splash and a spread on the interview, but also offers readers the chance to read every word of the conversation digitally. Let me run through this again. The Times thought that the most important news event of yesterday was an 83-year-old foreign leader who left office 15 years ago talking about his relationship with an 87-year-old woman who has died. So important, indeed, that it also ran a top leader, which concluded that Thatcher got it wrong and Kohl got it right about the unification of Germany in 1989 - although the editorial expressed no opinion on how this might have any relevance to the present day. For heaven's sake. My daughter conducted the same analysis for her IB history exam. Yes, really. She had the assistance of a huge and expensive red volume called German Unification 1989-90, Documents on British Policy Overseas. I doubt it will be updated to take into account The Times's opinion today. But even after all this, I do believe that the most interesting story of the day was the death of an 87-year-old who had a profound impact on millions of people - Professor Sir Robert Edwards, the IVF pioneer. 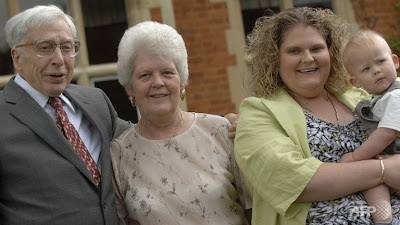 Edwards and the surgeon Patrick Steptoe overcame opposition from the Church, politicians and even fellow scientists to 'create' the first 'test-tube baby', Louise Brown in 1978. They went on to found the world's first IVF centre in Cambridge, and persevered with their work in the face of unrelenting criticism and the withdrawal of funds.Since Miss Brown was born, more than five million people have had babies through fertility treatments. Edwards was awarded the Nobel prize for medicine in 2010 and his achievements were yesterday likened to those of Marie Curie, Charles Darwin and Albert Einstein. That's one for the back of the book, then. Thank heavens, some balance at last. Robert Edwards and his colleague Patrick Steptoe not only gave hope to millions but helped mankind understand more about the process of human fertility. It should also be remembered that their work was done under the auspices of that political football, the National Health Service. The first test-tube baby, Louise Brown, was born in an NHS hospital. 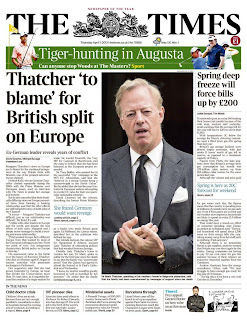 A personal note on the other demise: Mark Thatcher may have been a favoured son, and one must remember that he and his sister have lost a mother, but it was to my mind a huge miscalculation to plaster his picture on the front pages of the national press. Luckily, I managed to avoid buying those misguided newspapers. 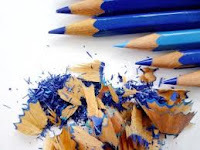 In fact, I am tempted to eschew newspapers until the whole sorry saga is over. 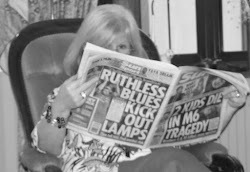 Perhaps when we get past the glut of The Iron Lady's Funeral supplements next week, we can poke our heads over the ramparts again and look at a newspaper without gritting our teeth? Loved your blog Liz, so perceptive as ever. Please keep them coming.